Jingle Smells!! Fab Festive Fragrances from Pure Essential Oils: Frankincense. - Amphora Aromatics Ltd – Supplier of pure essential oils and aromatherapy Products. Jingle Smells!! Fab Festive Fragrances from Pure Essential Oils: Frankincense. We’ve been looking at how pure essential oils can help to provide fabulously festive aromas in your house and office. Today we feature Frankincense. Click to discover more. Christmas is many things to different people. You might be looking forward to a quiet, relaxed time with family and friends or, like me, you might have young children and things might be a little more frantic! Either way, Frankincense is a lovely oil to burn at this time of year. It has a gorgeous sweet aroma and provides a wonderfully relaxing and calming atmosphere for those times when things get just a little too much. Whether to calm yourself after a hectic shopping trip or to help soothe the excited children on Christmas morning (and help them get to sleep on Christmas Eve! ), Frankincense is a great oil to keep handy during the festive season. There have been various interpretations by Biblical scholars over the years as to why Frankincense was one of the gifts brought to Jesus by the three kings. Some say that each gift was a spiritual symbol; Gold representing divinity, Frankincense representing holiness and righteousness and Myrrh symbolizing the suffering that would occur when the time of sacrifice came. 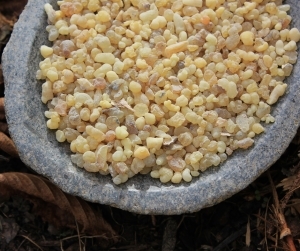 We provide both pure essential oil of Frankincense as well as the pure resin incense. The incense can be burned on an open fire or an incense burner to add a truly festive feeling to your space – see the product page for more details. Essential Oils (for a lovely Christmas scent you can use Frankincense blended with either Vanilla, Cinnamon or Orange). Simply gently melt the ingredients down in a double boiler (or in a bowl suspended over a saucepan on low heat). Once your mixture has liquified, add in your drops of essential oil (roughly 15 drops in total would be sufficient). These gorgeous balms can be used as lip balms, a dry skin treatment or as a temple balm to soothe and calm. They make an ideal gift at Christmas time. We sell both pure essential oil of Frankincense as well as the pure resin incense. The incense can be burned on an open fire or an incense burner to add a truly festive feeling to your space – see the product page for more details. Thank you for reading! Don’t forget to take a look at our other blogs for more Festive ideas as well as plenty of other advice, tips and blends.